Preheat the oven to 180°C. Sauté the spring onions with a teaspoon of oil until soft, then add spinach and sauté for another minute. Leave aside to cool in a large bowl. Place the shallots into a medium-sized frying pan with the remaining olive oil, salt, and sugar; sauté over a gentle heat until slightly caramelised. Place the toasted California walnuts into a food processor and blitz until coarsely chopped. Add chopped dill, dried mint, nutmeg and eggs into a large bowl with the sautéed spinach, season with ground black pepper and stir to combine. Brush a 20 cm x 30 cm baking tray with butter and line with three layers of filo, brushing with butter in between each of the layers. Spread over half the caramelised shallots, followed by half the spinach mixture, half the feta and one third of California walnuts. Repeat the layers using the remaining fillings, reserving a third of the California walnuts. Finish with a final third layer of buttered filo, trimming the final layer to fit the dish. Brush the top with butter and sprinkle a little water over it. Place it in the oven and bake for 25-30 minutes, or until golden brown and crispy. 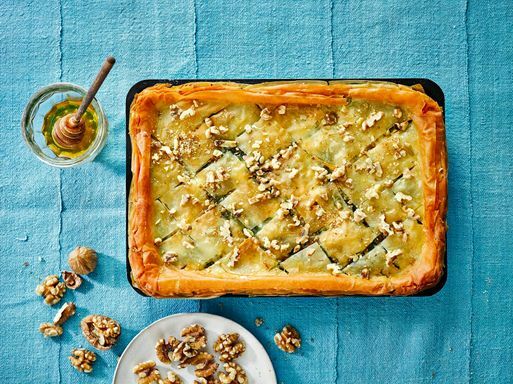 Sprinkle with the remaining California walnuts and drizzle with honey to serve.